static const Common::UString kGameName = "Star Wars: Knights of the Old Republic II - The Sith Lords"
Definition at line 38 of file probes.cpp. Definition at line 43 of file probes.cpp. Definition at line 44 of file probes.cpp. Definition at line 58 of file probes.cpp. Definition at line 46 of file probes.cpp. Definition at line 50 of file probes.cpp. Definition at line 54 of file probes.cpp. 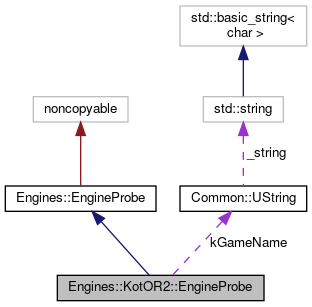 const Common::UString Engines::KotOR2::EngineProbe::kGameName = "Star Wars: Knights of the Old Republic II - The Sith Lords"
Definition at line 40 of file probes.cpp.